Whether it’s how to study whole night, how to grow your business or peppery news about your favorite celebrity, you must be among those netizens who hovers search engines for their every answer. The fascinating thing is we usually get legit answers of everything we look on these search engines. Ain’t they treasure of Information? But how do these search engines know everything? Form where they gather all the information? How they serve the information to you in just one click? 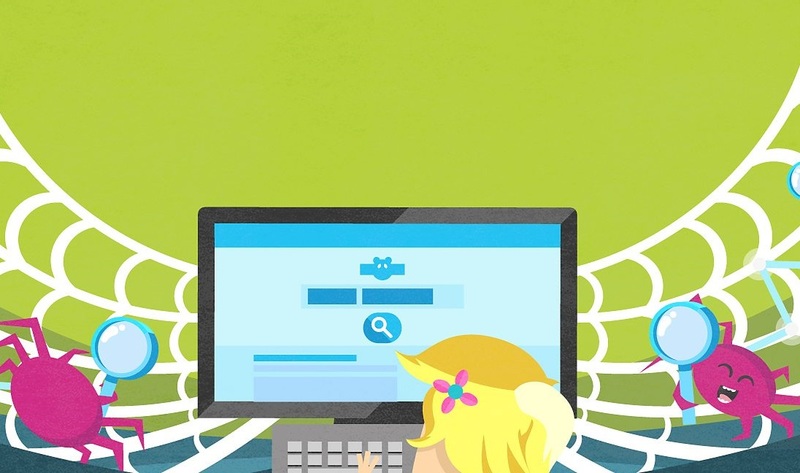 Basically, the question is, how do search engines work? The basic technique implemented by almost all the search engines like Google, Bing, Yahoo, DuckDuckGo, Baidu, Wolframalpha and others are same. They all pull out several formal/informal data posted on web on user’s query. From Where Search Engines Get All The Information? There is nothing published on any search engine. Whatever logical, illogical, promotional, personal, formal, business like data we see on Internet is not posted on Search Engines. These data are actually published on the vast web domains and search engines are also only a component of World Wide Web, like data & information. World Wide Web, abbreviated as WWW is the synonym to what we called Internet. This is the only informatory space where we put, post and pull data when needed. There are several host services and domain providers to provide us space for fabricating our data on Internet while publishing. Search engines are the Computer applications that identify web resources (documents, audios, videos, etc.) by URL, inbound/outbound links and showcase it to query makers. They search web pages based on URL and Keywords. They create an index of relevant web documents, when they find them. They provide users more set of queries as suggestions whilst they ask their question on these browsers. So now, we know what are search engines and what they do, but the big time question is how they do it, because there are millions of web documents scattered over the Internet. As a user we have so many questions on diversified topics, from how to make pizza to how to improvise sales revenue. Then what makes these SEs so precise in their working? How they extract user specific answers from the infinite source of answers, i.e, Internet. Search Engines particularly do two basic things, Crawling and Indexing. These two functions are done to create a SERP. The indexed page that we get after a query is called SERP (Search Engine Rank Page). SERP too has great importance for businesses which we will discuss later in the post. For now, dive deeper on Crawling and Indexing! This process is done by web crawlers, they are also called as Web spiders or ant. Crawlers are the web bots that scrape related query based on the keyword from web and store it in web repository. A web repository is similar to database with very limited access to intended users. It stores all the web page scraped by crawlers. Storing data on web repository allow SEs and users to get answers quickly. After extraction and storing of web pages, these are further used for indexing to display at SERP. ‘Selection Policy’ to determine which pages it will save at repository. ‘Re-visit Policy’ to check repository at intervals to ensure only the latest data are stored. ‘Politeness Policy’ to regulate the download rate by crawlers for server maintenance. ‘Parallelization Policy’ to enhance the download rate by running multiple processes by a parallel crawler. 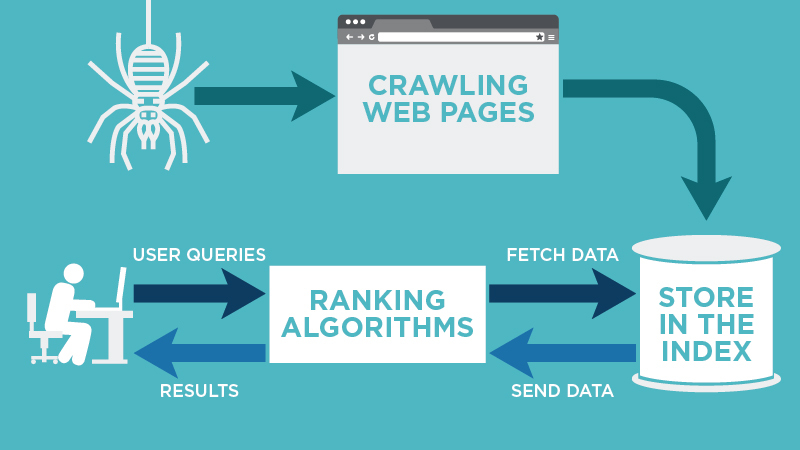 A crawler also has algorithms to avoid replications while extracting and storing of information. Indexing also called as ‘Internet Indexing’, is the process of organizing web pages within the repository for better depiction. They are used to rank web contents on the basis of the keywords, meta descriptions and titles. It is similar to indexing of a book, but is not similar in the implementation. Where indexing of the book represents a sequence of chapters and chapters at lower are equally important, in Search Engine Indexing extracted results at higher rank are better. The are more readily visible to users. Well, the aforementioned descriptions were on what happens behind the scenes, let’s have a glimpse on the image below to understand how crawling and indexing by Google display results to users. What are Search Engine Ranking Factors? Search Engines use as much as 200 factors while crawling and indexing web pages. Earlier the algorithms which SEs use to crawl and index were not so complex as a result, users get SEO contents rather relevant contents as results. To intensify user experiences, SEs have done so many updates in their algos to provide users both keyword based and relevant pages. They don't judge the contents on keywords but also check relevancy and accuracy with keyword throughout the content. It refers to those factors that are beneficial in increasing website’s visibility. 2. Length of the content. 3. Content free from Plagiarized contents. 4. Contents free from grammatical errors. 5. Contents categorized in H1, H2, paragraph, etc tags. It refers to embedding authenticate links to and from your content. SEs checks the relevancy if any web page link to your site or if you link to any other website. Bear in mind, SEs can even spam or flag those pages who forcefully stuff irrelevant links in their content. Domain Registration Length: SEs rank domains more trustworthy who at least have more than a year long registration. Domain History: If the domain you are acquiring now has a bad past experience, it can negatively affect its current ranking as well. Country TLD extension to Domains: Country Code Top Level Domain ,will optimize your site rank for country wide SEO. Site factors cover site-wide elements like server location, sitemap, site’s verification by SEs webmaster tools, mobile friendly websites so that they get load quickly on mobiles,etc. What Could Be Your Take? You are here, it implies you are someone who wants to play with search engines’ tactics. Being a marketer our sole objective is to make your online presence stand uut but since Search Engines are the gateways, you can’t rule Internet until you know how to draw everything as per Search engines requirements. This is however, the simplest funda, you put that data which SE will extract and display and they display only those data which users want to see. So working on your data as per search engines are in a way to work for your targeted users only. The practise of designing your web content to get higher ranks in SERP is called Search Engine Optimization (SEO). Every online business opt SEO strategies to make their brand visible and popular among users. Though SEO at first glance appears complex and apprehensive, but you can go well on it with a little practice. You can also find automated solution and services to help you in specialized SEO for your brand. After knowing the indices search engines devise to rank articles and other web documents on their rank page, marketers can implement the same to conquer higher ranks. The complicated algos of SEs might seem impervious. Indeed, there are many SEO providers that work on your site to optimize its web ranking. Some of the best SEO practices along with few service providers are listed below. 1) Do Market Analysis: This is the preliminary step before starting any business. It gives information to draw a basic sketch of your business. It involves processes to examine the prerequisites of your niche and what things are trending and what things need a break for some or longer time. 2) Do Competitors Analysis: It refers to analyse the acceptance of audiences to a particular niche. If your competitors are doing well, you too can nail it with better strategies. Or if they are failing to achieve better conversion, learn from their mistakes so that you don’t repeat them. Remember, it is the best way to follow well versed techniques to be a pro. 3) Abundant Keyword Research: It refers to highlight your posts regarding product descriptions, Ads, etc. with a particular keyword so that they can be seen easily. There are many free tools which you can use for keyword research for example, ‘Keyword Tool’, this tool will give you more than 750+ long tail keyword suggestion for a particular keyword. There is an another tool named ‘Ubersuggest’ which does the same. For paid services , you can try Google Adwords or KWFinder. 4) Content Optimization: It is the simplest method for SEO. Content optimization includes bringing an enticing content to the readers. It involves presenting visuals and texts in persuasive manner too. 5) Social Signals: It refers to comments, likes, shares and reviews we get on our posts. The more ‘likes’ a post get, the more popularity it becomes. Having a balanced figure of social signals on your account is always favorable. You can rely on your followers to get a sufficient number of social signals on your account but in case, you find yourself lagging behind, you can buy these social signals. We have covered a lot aspects of Search Engines and how they work, in the post. We also went through the introductions of some primary practices and services for SEO. Try these tips today and see your business ranking higher in SERP. If you like the post or have any query, please drop it in the comment section below. Share the post to help your friends also!! Hello, Mates! I'm Sumit Ghosh, CEO of Socioboard Technologies and the Marketing Head of Socioboard. I'm responsible for the overall marketing strategy of SocioBoard, including product marketing, positioning, inbound demand generation and online marketing. Socioboard's new approach to open source social media management is changing how Social Media Marketing companies, digital agencies, corporations, and web/broadcast media across the world thinks about Socioboard. Follow Socioboard on Facebook and Twitter.